Better Marketing: Using social media as an in-bound marketing tool for employers to find you, on top of your resume, which is an outbound marketing tool that relies on your to market yourself. Increased Visibility: More hiring managers than ever are using social media as a way to tap into new candidate pools within their industries. Storytelling: Leveraging social media to communicate the information you want hiring managers to know about you, and compile it into a robust story about your careers, versus a list of skills and experience. SEO: The bigger your presence on the most appropriate channels, the likelier you are to be found by people searching for candidates in your field. Do yourself a favor and invest in a professional headshot or two, and use the consistent profile images for all of your networks, making it easier for people to recognize you. Make your profile polished – this is your digital resume, your online business card, and the first thing people will often see about you, so enlist tools that make a solid first impression. Keep consistency with your headlines where possible – think about how you’re describing yourself. Is your Twitter tagline conveying something completely different than what you say on LinkedIn or Google+? Make sure what you say in the body of your profiles supports the high-level idea presented in your headline. “Innovative Graphic Designer, Expert Creative Problem Solver”? Explain to me what that means in terms of what you’ve done – what solutions have you come up with through your design, your client list, the type of work you’ve done, and how it’s impacted your customers? Don’t fall into the trap of creating a one-off and never tending to it again. Your accomplishments and career trajectory will change, and potentially even your target audience, and your profile should reflect those things. Don’t just create a Twitter profile, stand back, and see who follows you. Connect with thought leaders and companies of interest in your industry, participate in conversations, get involved in Facebook and LinkedIn groups, and share interesting content and ideas of your own to positions yourself as knowledgeable and in-touch with what’s going on in your field. Everyone knows social networks are about connecting. But what do you do with those relationships once you’ve started to build a foundation? Follow people, comment on their ideas and content, share it, share your own ideas if they seem like they’d be something of interest. It’s not just about making connections, but taking that to the next level by actually engaging with people, talking, sharing, cross-promotion, and building that connection into an actual relationship with mutual respect and rapport. There’s no better way to stay on someone’s radar while also keeping them abreast of what’s going on in your world. 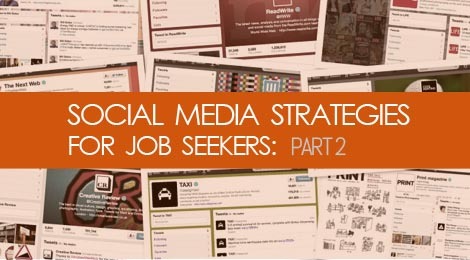 We’ll continue to explore this topic more in the coming weeks, and look at more tools, statistics and best practices for leveraging social media in your job search, connecting with key hiring managers and influencers, and building visibility and credibility that’s going to help you stand out in this competitive market. In the meantime, if you have questions about how you can be leveraging social media to increase your own visibility, build your brand, and get the most of your job search, head on over here to find out more about how the Personal Social Media Portfolio can boost your online presence and get you hired faster using professionally branded content for your networking profiles. Tags: branding, career, communication, job search, marketing, personal branding, social media. Bookmark the permalink.